Nice. 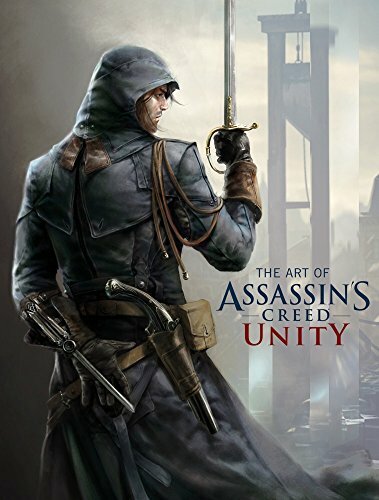 Another wonderful artbook to the Assassin's Creed series. I like Assassin's Creed artbooks because they usually feature beautiful landscape artworks of historical places from the past. In Unity, it's in Paris during the French Revolution. Presentation style is similar to the earlier artbooks with a good mixture of character designs and environment art. The costume designs for all the characters are beautiful and detailed. I've always wondered how people in those times managed with so many layers of clothing and how heavy they weigh with all those accessories and weapons hanging all around. Almost all the characters are male except Elise De La Serre. The other artworks are all on the landscapes, interiors and key scenes. It's really cool to see how the artists interpret old Paris. There are the rooftops of Paris with their familiar chimneys. exquisite monuments such as the Conciergerie, Notre Dame, Eiffel Tower and other landmarks and less savoury places. There are some really nice textures going on that show the nitty-grittiness of the places. I really enjoy looking at the architecture design of buildings at that time. The artworks are generally beautiful although some pieces are quite rough, thankfully in minority. Composition for most of the environment art are fantastic, and really captures the scenes well. It's a great companion to the video game.